You have to move a box up (and down). What's your best solution? When it comes to space savings, spiral conveyors are the obvious choice when compared to incline conveyors. The load, the application, and situation must fit, but in general a spiral system will consume far less floor space in your operation. Versatility: Both inclines and spirals can work in a variety of situations. Inclines can suspend between elevated lines where some spirals might not work, but spirals can convey more product in a given vertical space. Inclines can also be installed at various points along a line to feed from a pod of carousels, a picking area, etc. Both of these conveyor types have their place in a modern operation. Energy savings & sustainability: Spiral conveyors consume less energy than inclines in most situations. In the illustration above, you can see that in this application, the incline system uses 7 drives while the spiral conveyor solution uses only 3, for a 133% more efficient operation. Aside from reducing the number of motors, the proprietary rolling friction design of the slat chain makes the spiral conveyor extremely efficient. 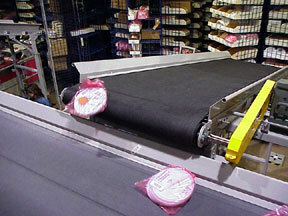 Cost: Incline conveyors are typically less costly than spiral conveyors. Integration issues: Spirals typically reduce integration costs by simplifying wiring, installation, and controls costs. Throughput: Spiral conveyors can pack more cartons or other loads into the same space, and have sufficient conveying speed to move it more quickly. Throughput isn't a particular weakness for incline systems, but they aren't as fast as a spiral in most situations.